My fifth ground of 2016 was on Saturday 26th March at Kellamergh Park in Warton, Lancashire. 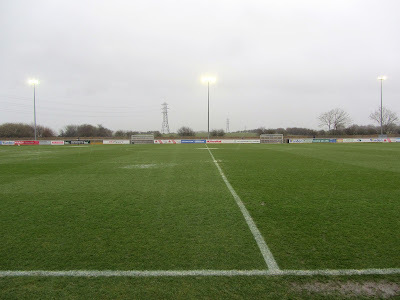 The match was AFC Fylde vs. Bradford Park Avenue in National League North. Kellamergh Park was located in countryside just north of the village of Warton. Surrounded by fields on all sides the ground was accessed via The Birley Arms pub car park. The nearest railway stations at Moss Side and Kirkham & Wesham were around 3 miles away. The venue had only been home to the club since 2006 but with ambitions to reach the Football League AFC Fylde moved to a new 6,000 capacity stadium on the outskirts of Wesham for the start of the 2016/17 season. 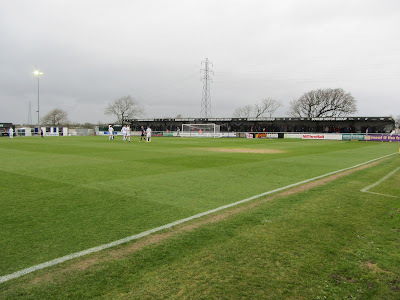 The western part of Kellamergh Park included the Main Stand which took up around half of the space alongside the pitch. It had 282 seats including a press area and also had a TV gantry positioned on top of it. 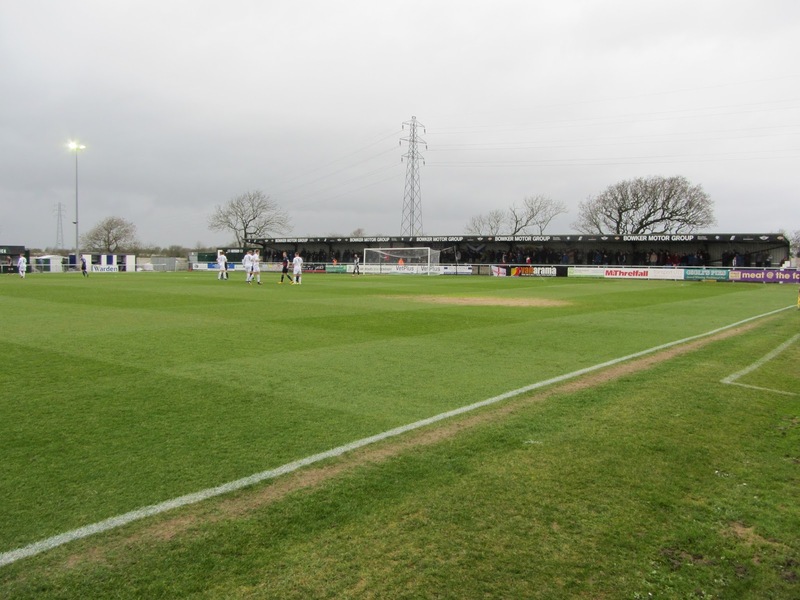 This stand was flanked by two shipping containers which had been converted to hospitality areas. 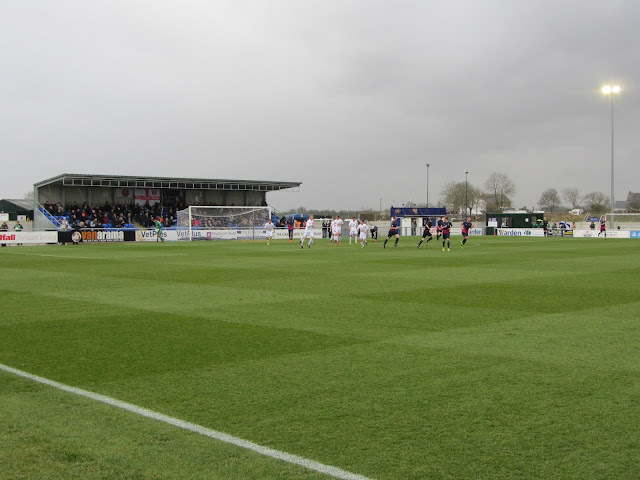 There was another smaller container in the south-west corner which was home to a club shop. Working round to the southern end of Kellamergh Park there was a newer all-seater stand directly behind the goal. This stand was completed in March 2015 and had 250 seats spread across seven rows of seating. Next to this was a food outlet and then another shipping container which served as Fuller's Bar. The southern side was completed by a scoreboard in the corner. Uncovered hard standing made up the western part of the ground though there were raised concrete sections throughout to slightly improve viewing. The two dugouts were located on this sparse section of the stadium. Finally the Wrea Green End behind the northern goal consisted of a covered terrace - this had eight levels of concrete steps with two sections of uncovered hard standing bookending the stand. 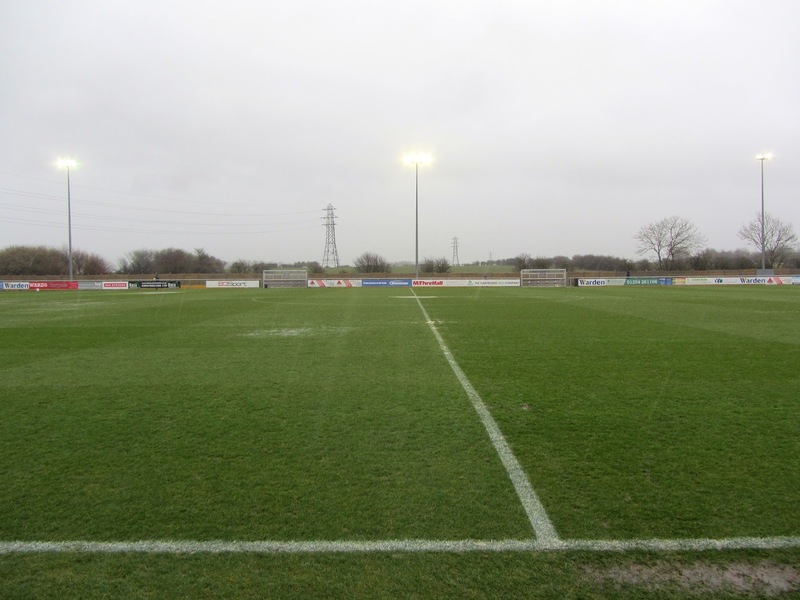 There had been a fair amount of rain in the build-up to the match but it had ceased an hour before kick-off so the pitch was in reasonable condition to start the game. A quarter of an hour into the game the rain started again and this time it was torrential. The rain coupled with strong winds presented real difficulties for the players with goal kicks and throw-ins regularly being blown straight off the pitch. 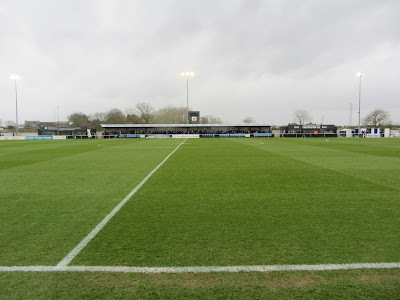 The only action of note came in the 27th minute when a Fylde free-kick was handled in the box and Danny Rowe smashed home the penalty to put the hosts 1-0 up. Even before this the rain was saturating the pitch and one particularly bad area near the northern goal became completely waterlogged. When the ball landed in this area just after the half-hour mark it completely stuck to the ground despite the players attempting to clear the ball to a better area of the pitch. At this point the referee halted preceedings and after discussions with both managers the game was abandoned after 32 minutes.